In the construction of the NSR superstring as a 2d SCFT from a supersymmetric sigma-model one needs to remove one half of the sigma-model-excitations in order to achieve that the resulting 2d SCFT satisfies modular invariance, hence that it is defined not just on the complex plane but also on tori. This halfing of the naive sigma-model spectrum is called the GSO projection, after GSO 77. Depending on how the GSO projection is chosen, one gets type IIA string theory, type IIB string theory or type 0 string theory. A good account is in Majer, sections 1.3 and 2. 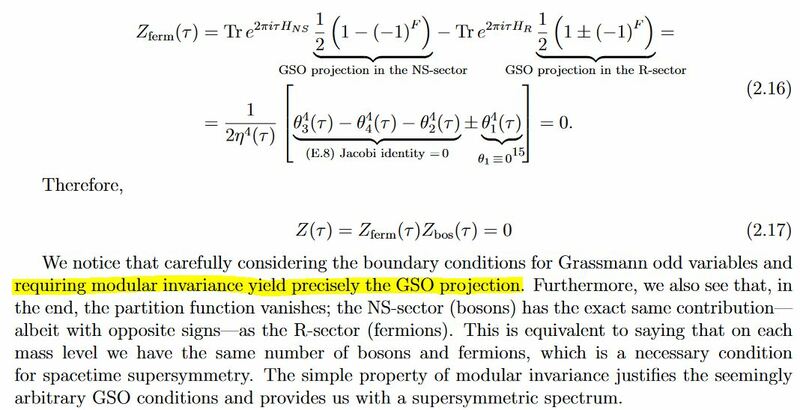 The GSO projection to the type II superstring together with the Goddard-Thorn no-ghost theorem implies that the effective field theory encoded in the string scattering amplitudes (S-matrix) is a supergravity theory (Green-Schwarz 81). This way the mere assumption of strings with fermions in their spectrum (originally just called “spinning strings”) implies local supersymmetry_ in target spacetime. For more on this see string theory FAQ: Does string theory predict supersymmetry? One should really check that the 2d SCFT is well defined on all worldsheet genera, not just on genus 1 as given by modular invariance. Because correlators at all the higher genera enter the string perturbation series at higher loop order. But this is subtle for the NSR superstring, see at super Riemann surface for more on this. A full construction of 2d CFTs at all genera has been achieved only for bosonic rational 2d CFTs, see at FRS-theorem on rational 2d CFT. The Green-Schwarz superstring sigma-model gives an alternative description of the superstring, where spacetime supersymmetry is manifest throughout the construction. No “GSO projection” is needed here, and no analog of the Goddard-Thorn no-ghost theorem needs to be proven. The downside is that generalization to higher genera and to curved spacetimes is less immediate or unclear. Supersymmetrical string theories , Phys. Lett. 109B (1982) 444. Paul Howe, Super Weyl transformations in two dimensions J. Phys. 12 (1979) 393. Last revised on January 21, 2019 at 01:40:18. See the history of this page for a list of all contributions to it.